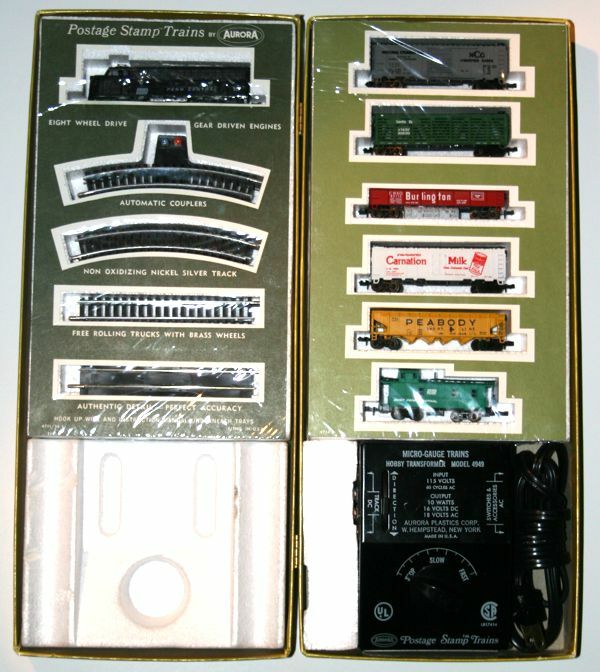 Aurora's iconic "bookshelf boxes" were undoubtedly the most recognizable—if not the most frustrating—train set packaging ever known. They stood as a perfect storm of contradiction. On the one hand, they were innovative and eye-catching; indeed, they earned Aurora an award from the Hobby Industry Association of America (HIAA) for package design. On the other hand, they were virtually impossible to use once the cellophane was removed from the trays inside; as the box was opened or closed, items invariably fell out of the trays—not to mention there was nothing to hold the trays' cover sheets in place. Thus it's not surprising to find most of these sets to be in poor condition today. 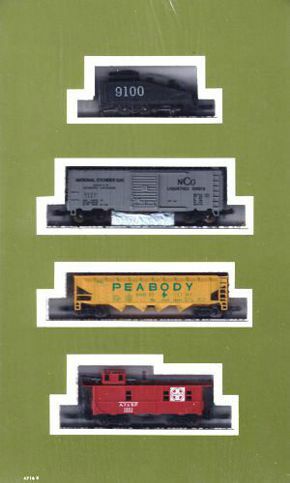 Boxes came in four sizes: a narrow version for freight sets, and a slightly wider one for passenger sets; each of these had tall and short versions for sets with and without power packs, respectively. 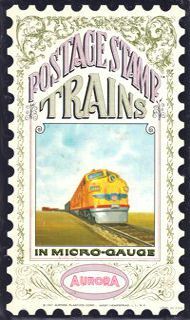 There were four styles of cover art: a 4-4-0 steam freight, a Union Pacific diesel freight, a Santa Fe diesel freight, and a Baltimore and Ohio diesel passenger. 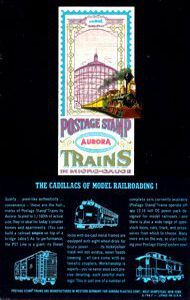 However, contrary to claims in the catalogs, the box art did not always correspond to the set contents. 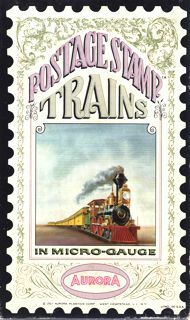 Note that the B&O set with power pack had no filigree artwork around "Power Pack Included." On the bottom end of the box was space for set identification, which tended to be a mix of pre-printed catalog numbers/descriptions and separately-applied labels. Some labels were corrected by hand (example below right), underscoring the chaotic nature of post-1967 sets. The backs of the boxes all had the same artwork. All packaging was made in the US. Each box contains two Styrofoam trays: the one on the left holds the locomotive and track, and the one on the right holds the rolling stock. 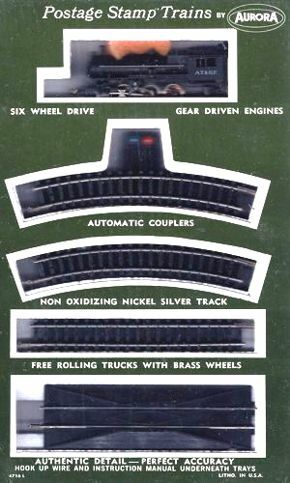 Various trays were made to accommodate the wide variety of rolling stock options, although every set has the same track components. The rolling stock tray always contained a desiccant (a drying agent in a small lumpy pale blue cylinder, right) tucked under one of the cars. 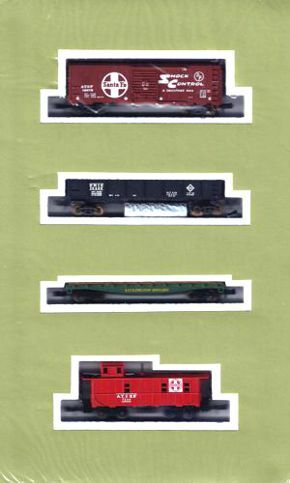 Freight car road names were selected at random from the four or five available for each car. The trays are topped with printed cover sheets in two shades of green: dark pine green for the left, lighter olive green for the right. 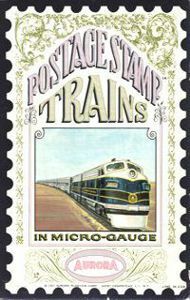 1968 and later cover sheets have the set catalog number followed by -L or -R in the lower left corner; they also have more white space around the openings. 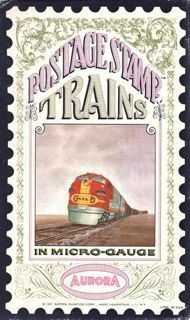 However, some later sets were packed with earlier cover sheets. 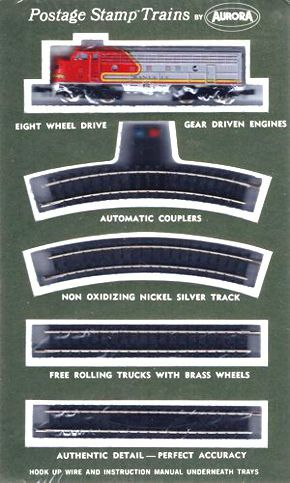 The O-Six-O sets were the only ones to have cover sheets with an enlarged opening over the rerailer track. Since there's nothing to hold the cover sheets in place after the cellophane is removed, they're often either taped to the trays or thrown out. Beneath either tray—but usually the one on the left—will be the service manual, either the 1967 version or the 1968 version. For sets having a power pack, two pieces of "hook-up" wire, one red and one blue (or, on very rare occasion red and green), are stowed under the tray on the right. The wires are about a foot long, and the ends are stripped. Sets with power packs have two pieces of Styrofoam blocking: one is molded to fit over the pack, and the other wedges against the side of the pack to keep it centered (the filler piece is often discarded by owners who didn't care to neatly re-wrap the power cord). Passenger sets have two small extra pieces of blocking foam to compensate for the wider boxes. There are two distinct types of track that are virtually indistinguishable: one has rail made from a corrosion-resistant ferrous alloy, and the other is traditional nickel silver (feeder tracks were always nickel silver). A magnet can be used to identify which is which, since nickel silver is non-magnetic. Most 1967 train sets have the ferrous track, whereas it's rarely found in later sets. 1967 sets have ten pieces of straight track, plus a snap-in rerailer. By contrast, 1968 and later sets have only three pieces of straight track and a rerailer track section. Two "P.S.T. Special Sets" contain 39 pieces of track.